On the 30th of July BRIDES magazine hosted their Reader event and Designer Catwalk Show at the Mandarin Oriental Hotel in Knightsbridge. 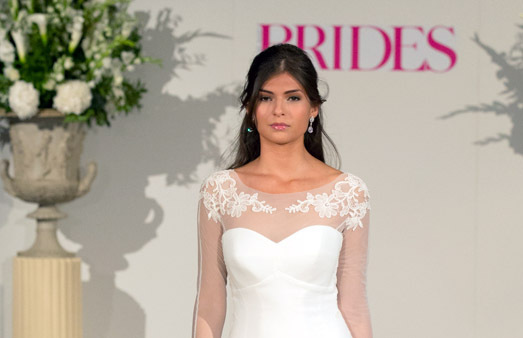 Our dresses were showcased to an exclusive audience of 150 Brides Magazine readers. The event included top British Bridal Designers as documented in Brides magazines ‘The White Story’. 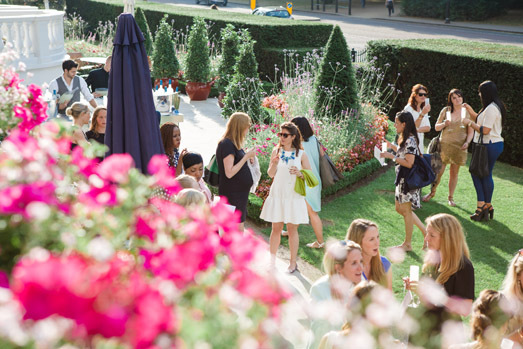 The event took place on a beautiful evening, with the sun setting over the Mandarin Oriental terrace that overlooks Hyde Park. Guests gathered in the sunshine, surrounded by circling canapé’s, whilst Grey Goose served the fabulously refreshing Le Fizz cocktails. 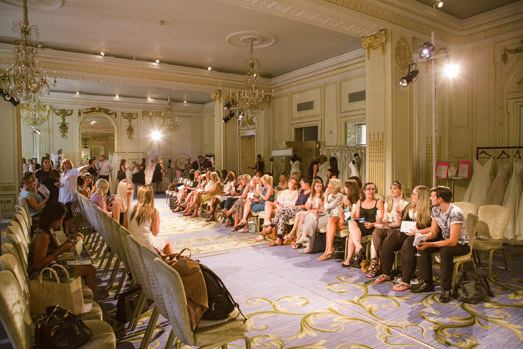 The catwalk show then took place in the hotel’s Ballroom, which was the perfect setting to showcase four dresses from each of the ten designers. The four Suzanne Neville dresses were from the 2015 Novello collection, and provided a sneak preview to the latest collection. Grovenor (pictured below) with its beautiful lace bodice, sheer lace sleeves and cascading full skirt, complimented with a beautiful lace trim. Brompton (pictured below), one of our favorites, with a structured bodice that flatters the figure and highlights the waist, paired with a soft skirt, sheer shoulders and finished with a delicate diamante trim. Phoenix, a beautifully flattering shape with a sheer embroidered sleeve and sheer dropped back. Intricate floral lace detailing highlights the top and back of the dress; simple, yet beautifully classic and sophisticated. Lamont, beautifully sweeping silk that originates at the slight twist on the shoulder. This dress glides over the figure and flatters the bodice, with a diamanté detailed belt adding a glisten to this elegant design. Hair Stylists at Michael Van Clarke led by Gustav Fouche created the beautiful runway looks. Gustav and his team took on the modern red carpet glamour and gave it a bridal finish with the sparkling jewels of Oliver Laudus. Bobbi Brown’s beauty team created an equally contemporary look, showcasing smoky eyes and flawless skin for a screen goddess-worthy look. 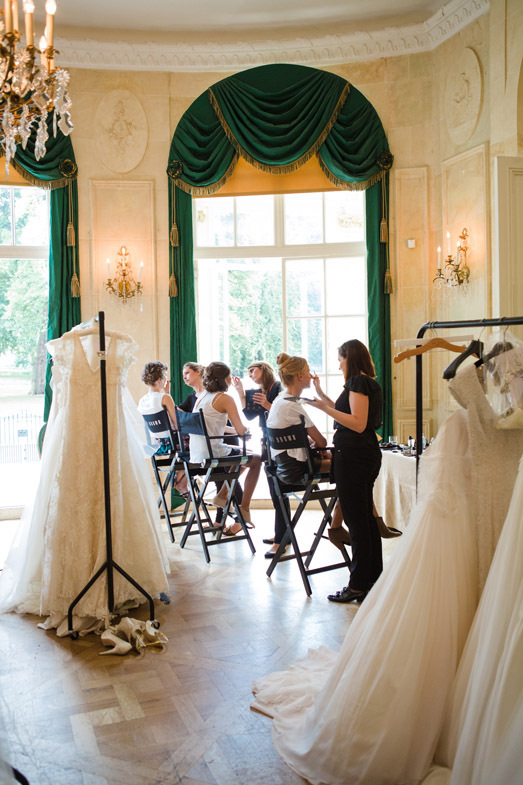 Brides then had the chance to mingle with Britain’s top bridal designers and talk to Suzanne herself about the dresses, asking her any burning questions they might have. The evening was a lovely chance for brides to see the latest collections whilst enjoying the evening with friends and family. Suzanne Neville loved the opportunity to meet with the brides and be part of such a beautiful evening. We would like to thank the Brides team, Micheal Van Clarke, Bobbi Brown, Freya Rose for the beautiful shoes, Galton Flowers for the floral headpieces, and Grey Goose for making sure we were all were refreshed. 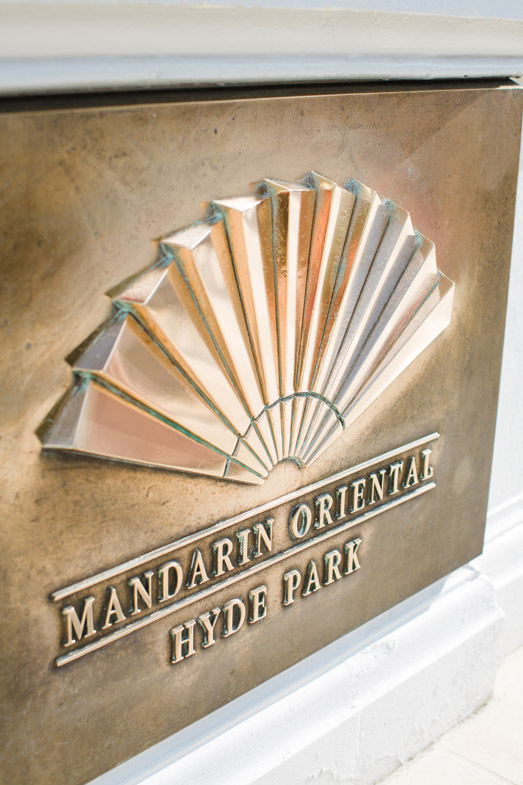 Not forgetting the beautiful Mandarin Oriental Hotel for their excellent hospitality.